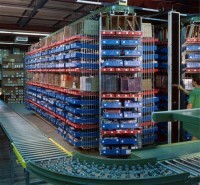 Horizontal carousels are ideal for high speed order picking, parts delivery and sortation applications. Our all-steel horizontal carousels position heavy duty bins to an operator automatically - saving space, reducing labor cost, speeding throughput, and improving order accuracy and inventory control using integrated software. Maximize space, efficiency and productivity – our vertical carousels deliver maximized space utilization, efficiency and productivity in all types of applications, including small parts and tool storage. Contact us for more information on carousels and how they can benefit your operation.